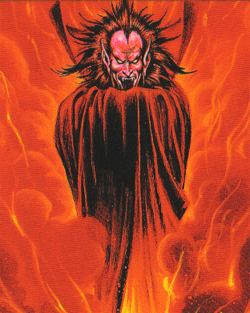 Suggested by iknowledge Mephisto is a pretty powerful Marvel villain. He’s always lurking just behind the scenes waiting to throw the world into chaos. That being said, he won’t have an answer for Yugi’s army of monsters. There are too many of them for him to stop and they all have special abilities. If he tries to go past them and head straight for Yugi he will quickly be ambushed by a trap card. It’s a lose-lose situation for him either way. Yugi wins. This entry was posted in Battles, Mephisto Battles, Yugi Battles and tagged Mephisto, Yugi by dreager1. Bookmark the permalink. In my opinion, Mephisto could still win this. 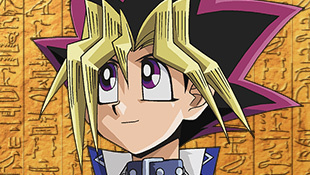 In his dimension, he’s nigh-omnipotent, and if he has his children, Yugi’s life is made more difficult. What’s to stop Mephisto from sending Yugi a vision of his grandpa and his shop about to be robbed, Anzu/Tea getting accosted, and every other of his friends being severely hurt or dead that Yugi will have difficulty telling reality from? Mephisto’s arrogance, I’ll admit, does get the better of him more often than not. But I don’t think he should be put out of contention on this one.